Eye infections come in many forms and are normally the result of a bacterial, viral or (rarely) fungal invasion. The infection can occur in any part of the eye and is more common in people that wear contact lenses. Some of the most common types of eye infection include: conjunctivitis, blepharitis and styes. More often than not, an eye infection will pass of its own accord after around a week but in some cases, treatment may be required. Conventional treatment usually involves antibiotic or anti-inflammatory eye-drops. 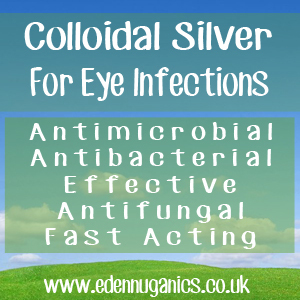 Colloidal silver is suitable for treating everyday eye-infections in place of conventional medicines and is very effective for this (in fact, colloidal silver is still administered to newborn babies in hospital in certain circumstances). On the other-hand, as your eyes are very precious organs, common sense should prevail and if something seems to be more serious or out of the ordinary, lasting longer than a week for example, then a trip to the doctor is advised. It is rare but if left untreated, some eye problems can affect your eye-sight long-term. Bacterial - Eye infection caused by bacteria is most commonly treated with antibiotics. These come in the form of eye drops, ointments, or sometimes even pills. Viral - This type of conjunctivitis (commonly known as 'pink eye' due to the redness of the linings of the eye), often results from the viruses that cause a common cold. Just as a cold must run its course, so must this form of pink eye, which usually lasts from 4 to 7 days. Viral conjunctivitis can be highly contagious. Avoid contact with others, avoid using the same towels as others and wash your hands frequently. Allergies - Allergy-associated conjunctivitis should improve once the allergy is treated and the allergen removed. See your doctor if you have conjunctivitis that is linked to an allergy. How can Colloidal Silver Help? Colloidal silver, (sometimes referred to as sovereign silver), is a simple solution of distilled water with suspended particles of the precious metal. Your body does not require or use silver for any process; however, silver has powerful antibacterial properties which have been known about for thousands of years, with Hippocrates (the father of modern medicine) first mentioning its use around 400 BC. One of the most common uses for colloidal silver is as a natural treatment for eye infections. It is still used in newborns to prevent the transmission of infection from mother to baby during delivery. The first step is to find a clean eye dropper. We recommended buying a pack of disposable droppers as reusing the same one can increase the chances of spreading infection. Or if you have a glass dropper, make sure to sterilise it in between uses. Simply add 1-2 drops of colloidal silver to each eye at bedtime until there is no more residual eye crust in the morning. This should take around 3-4 days. Optional - Colloidal silver can also be bought in gel form, this can be applied to the eyelid and is especially useful in the treatment of styes. Other Natural Remedies for Eye Infection? Manuka honey - Manuka honey has many infection fighting properties and is one of New Zealand's finest exports. Due to its composition it can be quite pricey in comparison to other natural alternatives but it packs a serious antibacterial punch. In fact, there are many official studies proving its effectiveness, not only in the treatment of eye infections but also a whole host of other common health conditions. Saltwater - Saline (salt water) eye drops are often recommended in the treatment of eye infections. Simply boil a cup of water and add around a teaspoon of salt. Next let the liquid cool completely before adding to an eyedropper for easy application. Salt water has antibacterial properties and acts as a humectant when applied to the eyes, meaning it will help to eliminate the infection and provide soothing relief. Herbal teas - There are a number of herbal teas that are known to help eye infections when used as a warm compress. Calendula, chamomile and fennel can be used effectively to reduce eye irritation and inflammation. Colloidal silver for ear infection, eye infection, pink eye.